cataracts from increased UV exposure. CFCs and HCFCs, HFCs have to be recovered and cannot be vented. Refrigerants (Freon, R-12 and R-134a) are the chemicals used in motor vehicle air conditioning (MVAC). By the end of 1995, EPA banned production and import of R-12. However, the use of R-12 is still permitted until supplies are depleted. Federal regulations state that it is illegal to vent any refrigerant to the environment during repair, service, maintenance, recycling or disposal of refrigeration and air conditioning equipment. Refrigerants must be recovered during all service, repair, maintenance and disposal activities. Recovery = removing refrigerant from air conditioning units and storing it in a container without testing or processing it; Spent refrigerants that are not reclaimed or recycled are regulated wastes. Reclaiming = processing refrigerant, usually by distillation, until all impurities are removed and meets virgin specifications. EPA requires use of EPA-certified refrigerant recycling equipment when servicing motor vehicle air conditioners. Refrigerant Recovery. The rules for recovery depend on whether the refrigerant will be sent off-site to a reclamation facility or to a MVAC service center for reuse without prior reclamation. If the refrigerant will be sent off-site to a reclamation facility, then refrigerant must be recovered using MVAC recovery-only equipment certified to SAE J1732 or J2810. There is no restriction on who performs the recovery. That person does not need to be a certified technician. If the refrigerant will be sent to an MVAC service facility for recharging into a motor vehicle air conditioner system without prior reclamation, then the same rule applies, but there is a further restriction. Prior to such recharging, the refrigerant must be recovered using approved refrigerant recycling equipment dedicated for use with motor vehicle air conditioners. This recovery process must be performed by a certified technician. Sale of Refrigerant. The rules for sale of refrigerant depend on whether the refrigerant will be sent off-site to a reclamation facility or to a MVAC service center for reuse without prior reclamation. If the refrigerant will be sent off-site to a reclamation facility, then it can be sent to facilities that meet EPA standards for reclaiming refrigerants or those that buy used refrigerant for transfer to the EPA-certified reclaimers. Anyone accepting MVACs for disposal must insure that the refrigerant has been properly removed before disposal by, (1) recovering the refrigerant at your facility or (2) obtaining a written signed statement from your customer verifying that the refrigerant hAs been properly recovered from all motor vehicle air conditioners prior to delivery to your facility. Records of recovery must be maintained for 3 years. Use the following list to audit your procedures for refrigerant/CFC management. The refrigerant was recovered using MVAC recovery only equipment certified to SAE J1732 or J2810. A section 609 certification form has been completed for the recovery equipment. The refrigerant was sold to facilities that meet EPA standards for reclaiming refrigerants or to a company that buys used refrigerant for resell to reclaiming companies. You have retained invoices that indicate the name of the purchaser, the date of sale, and the quantity of refrigerant purchased. A section 609 certification form has been completed for the refrigerant handling equipment. The refrigerant was sold to facilities that meet EPA standards for reclaiming refrigerants or those that buy used refrigerant to resell to the reclaiming operations. 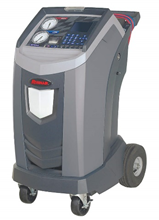 Use only EPA approved refrigerant handling machines when recharging or removing refrigerants. Recover refrigerants prior to crushing and dismantling vehicles. Verify that all vehicles entering the facility without refrigerant have had the refrigerant removed using proper methods. Employ certified technicians for refrigerant recovery. Avoid mixing R-12 and R-134a because contaminated refrigerant cannot be put back into the vehicle and must be sent to a recycling facility. Do not use alternative refrigerants containing liquefied petroleum (LP). These refrigerants not only cause contamination, but pose a safety risk due to their flammability. Be sure to use the proper O-rings, lubricants, etc. when retrofitting MVACs. Don’t allow R-12 to mix with oil prior to reclamation or recycling. Sell refrigerant to certified technicians or to certified reclamation facilities that will reclaim the refrigerant to its original purity specifications. Dispose of filters from CFC recapture as hazardous waste. Keep accurate records for at least 3 years. 2,3,3,3-Tetrafluoropropene, or HFO-1234yf, is a hydrofluoroolefin replacement for R-134a as a refrigerant in automobile air conditioners. HFO-1234yf is the first in a new class of refrigerants acquiring a global warming potential (GWP) rating 1/335th that of R-134a and an atmospheric lifetime of about 400 times shorter. It was developed to meet the European directive 2006/40/EC that went into effect in 2011 requiring that all new car platforms for sale in Europe use a refrigerant in its AC system with a global warming potential (GWP) below 150. HFO-1234yf, which has a 100-year GWP of 4, could be used as a "near drop-in replacement" for R-134a, the current product used in automobile AC systems, which has a 100-year GWP of 1430. This means that automakers would not have to make significant modifications in assembly lines or in vehicle system designs to accommodate the product. HFO-1234yf has the lowest switching cost for automakers among the currently proposed alternatives, although the initial cost of the product is much higher than that of R-134a. Initially, the refrigerant is expected to be about ten times more expensive than R134a. The higher retail cost of the product should be an incentive in the recovered product market for auto recyclers. The product will be handled in repair shops in much the same way as R-134a, although it would require different equipment to perform the service. One of the reasons for that is the mild flammability of HFO-1234yf. Another issue affecting the compatibility between HFO-1234yf and R-134a-based systems is the choice of lubricating oil. A new piece of recovery equipment will be required to capture the refrigerant. The rule governing the existing refrigerants will also apply to the R-1234yf refrigerant. Venting Prohibition Section 608 prohibits intentionally releasing (also called venting) ozone depleting substance (ODS) refrigerants and most alternatives including all HFCs, HFOs, and their blends, while maintaining, servicing, repairing, or disposing of MVAC equipment. CO2 refrigerants are exempt from the venting prohibition. R-134a is an HFC and R-1234yf is an HFO. Shortly after confirmation from automakers that R-1234yf would be adopted as a replacement of R-134a automotive air-conditioning refrigerant, Honeywell and DuPont announced that they will jointly build a manufacturing facility in Changshu, Jiangsu Province, China to produce HFO-1234yf, which is now in operation. In addition, Honeywell is building a new plant in Geismar, Louisiana, USA to produce the new refrigerant as well. Although others claim to be able to make and sell HFO-1234yf, Honeywell and DuPont hold most or all of the patents registered for HFO-1234yf. Although the product is classified as slightly flammable by ASHRAE, several years of testing by SAE proved that the product could not be ignited under conditions normally experienced by a vehicle. In addition, several independent authorities evaluated the safety of the product in vehicles and some of them concluded that it was as safe to use as R-134a. In December 2012, tests by Mercedes-Benz showed that the substance ignited when researchers sprayed it and A/C compressor oil onto a car's hot engine. Stefan Geyer, a senior Daimler engineer who ran the tests, stated "We were frozen in shock, I am not going to deny it. We needed a day to comprehend what we had just seen." Combustion occurred in more than two thirds of simulated head-on collisions. The engineers also noticed etching on the windshield caused by the corrosive gases. BMW, and VW-Audi agreed with Mercedes and left the SAE R-1234yf CRP Team, stating that the performed tests are not sufficient to fully judge the safety of their vehicles. The German Automakers have been leaning towards carbon dioxide refrigerant that is safer for both passengers and the environment. Although the EPA requirements DO NOT require recovery only technician to be MACS certified like technicians that recharge systems, the MACS Mobile A/C Training Class “Refrigerant Recovery and Recycling Certification (Section 609)” classes are updated to cover R-1234yf. The acquisition of the new piece of equipment will need to be reported to EPA, just as the R134a equipment was when it was first placed in to service at the facility. If you are unsure or have not reported the original acquisition of equipment that same form may be used to do so.